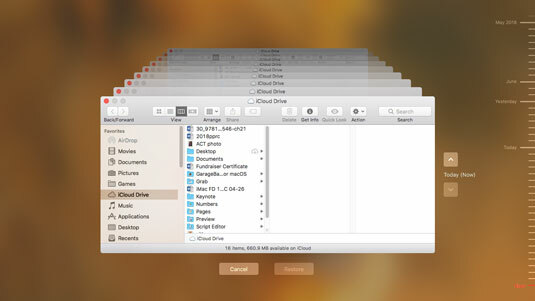 If you enable backups via the macOS Time Machine feature, you can literally move backward through the contents of your iMac’s internal drive, selecting and restoring all sorts of data. Files and folders are ridiculously easy to restore — and I mean easier than any restore you’ve ever performed, no matter what the operating system or backup program. Time Machine can even handle some deleted items, like Contacts cards! To sum it up, Time Machine should be an important and integral part of every Mac owner’s existence. Apple’s Time Capsule device (which has been discontinued) is designed as a wireless storage drive for your Time Machine backup files. If you’re interested in a single Time Machine backup location for multiple Macs across your wireless network, a Time Capsule is a great addition to your home or office. Open a Finder window and navigate to the folder that contained the file you want to restore. Click the Time Machine icon on the Finder menu bar (which bears a clock with a counterclockwise arrow) and then click Enter Time Machine. The oh-so-ultra-cool Time Machine background appears behind your folder, complete with its own set of buttons at the bottom of the screen (as shown). On the right, you see a timeline that corresponds to the different days and months included in the backups that macOS has made. Remember: The backup date of the items you’re viewing appears in the button bar at the bottom of the screen. If you want to restore all the contents of the current folder, click the Restore All button instead. Time Machine returns you to the Finder, with the newly restored file now appearing in the folder. Outstanding! Yes, Time Machine really does look like this! To restore specific data from your Contacts database, launch the Contacts application first and then launch Time Machine. Instead of riffling through a Finder window, you can move through time within the application window. You can easily restore the entire contents of your iMac’s internal drive from your Time Machine backup, too. Reboot your iMac and hold down the Command +R startup key sequence to boot using the macOS Recovery HD volume, then use the Restore function. Get an external drive, connect it, and turn on Time Machine. Do it now. Don’t make a humongous mistake.